Very delicate & simple combination of lustrous peach pearls & glistening rhinestones rings jewelry set gift your mother on her special day. 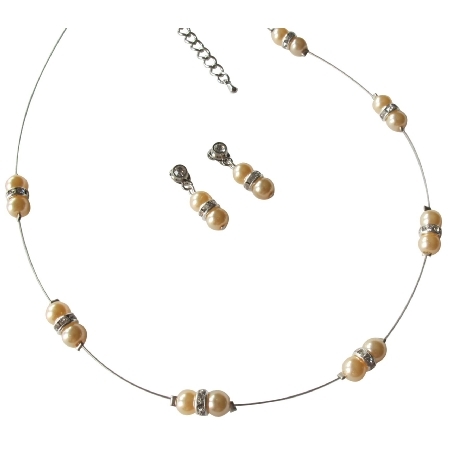 Peach pearls adorned in floating illusion necklace with surgical post earrings. Graceful jewelry would make her day & inspired by vintage glamour necklace earrings set for special occasions & modern classics for everyday. The spacer sparkle like diamond & will add a touch of shimmer to your everyday look. Material : 8mm Peach pearls adorned in illusion wire with rhinestones rings spacer with surgical post earrings.